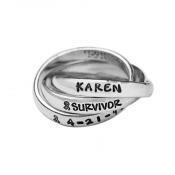 "Cancer Jewelry, Breast Cancer Ring Silver, Double Band"
A simple reminder that life is worth fighting for. 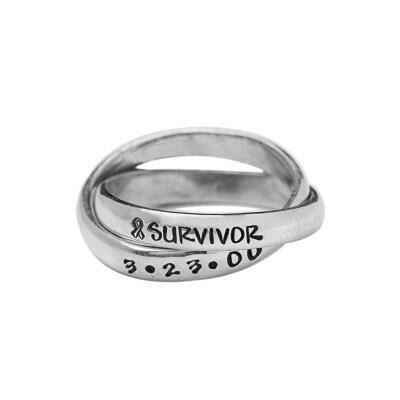 Whether you or someone you know is fighting breast cancer, ovarian cancer or some other disease, this ring can provide encouragement not to give up and keep going despite the challenges. 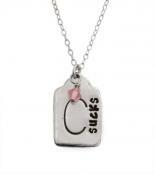 Are you a survivor of cancer or know someone that needs some encouragement to keep up the fight? 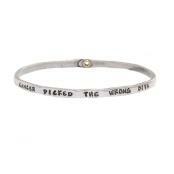 This ring is designed as a simple reminder that life is worth fighting for. 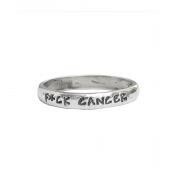 Whether it is a breast cancer ring, a ring to help fight ovarian cancer or any other type of disease, it is yours to customize and symbolize strength. Or consider putting a date that symbolizes a significant point in your journey. We also have a ribbon stamp you can add to any word or date. I absolutely love my ring and wear it everyday. My only complaint is I felt the sizing was off and I had to pay for the the shipping both ways to return it and have it resized.